Transcription of Obituary in the Primitive Methodist Magazine by E.W.G. William Gathercole was one of those Christians it is an inspiration to know. Those who knew him are not likely to forget him, and the remembrance will ever be a help. 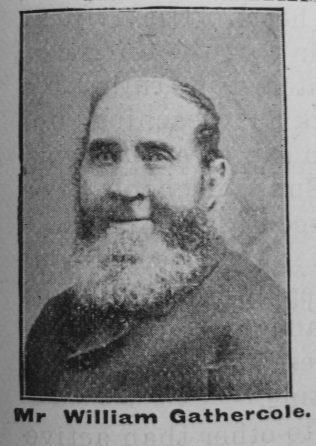 He was born on New Year’s day, 1816, at Sametony, Norfolk. He was sent very early to work on the land, but with a healthy occupation, and plenty of plain food he grew into a strong robust lad. In those early days he was a light-hearted, merry youth, the life of his company. When 25 years of age he was converted in the village chapel. His conversion was real. He was indeed changed. He lived a new life, he saw everything in a new light, and the villagers saw in him a new man. He at once joined the Wesleyan Church at North Pickenham, and became an active and useful member. He also signed the pledge, and became an ardent temperance worker. He removed to Ash Hill in 1846. Soon after his arrival the Primitive Methodists began to mission the place, and as there was no Wesleyan cause there, and this mission work being congenial to his nature, he joined hands and heart with our people, and was with us to his death. He opened his house for the services, and many were won for the Master. A society was formed, and Bro. Gathercole was appointed class leader by the Rev. Francis Webster, in which position he laboured with grand success. In 1853 his name appeared on the plan of the Brandon Circuit as a local preacher, with the understanding that he was always to have a colleague. In company with W. Lusher, and later with R. Dixon and others, he travelled many miles to tell those Norfolk villagers the story of God’s love and power to save. Often they returned home late and very tired, but full of joy that some had believed. For many years he thus laboured, sharing all the hardship and trial of those early days, sharing too, the gladness and triumph. In those days, Bro. Gathercole was intensely anxious that there should be nothing in his life that would bring discredit to his Master or the Church. He had a peculiar dread of debt. When wages were low, and his children little, he denied himself of many things that he may give some help to the Church, and keep free from debt. He succeeded in both. He often used to say in later days, that there never was a time in his Christian experience when he couldn’t say his prayers on the village green, whoever may be there to listen. In 1883 Mr. Gathercole came to live at Brighouse, in Yorkshire with his daughter, Mrs. Ellis. He at once joined our Church and entered into its life and work. Very soon both old and young learned to love him. His attendance at all services was most regular. Between the age of 70 and 75 he never missed the prayer meeting at 7 o’clock on Sunday morning, except when away from home. The same is true of the class and other meetings. To hear his prayer or his experience was a means of grace. The preachers used to look for him when they entered the chapel. Many a young man has been uplifted at the sight of his beaming countenance, and the sound of his hearty “Amen.” He made it easier to preach and pray. He was known and esteemed outside our own people. He had a word and smile for everyone, even the little children, and he was usually repaid by words and smiles again. Toward the end of his life his experience lost none of its brightness or buoyancy. He experienced a great trial in the death of his only son, Mr. Gathercole, of Leeds, in 1898. Being then 83 years of age, the blow was heavy upon him. After this his faith and trust were just as strong, but his physical frame was shaken, and we saw him grow weaker. His last illness was short. He lay in bed but for a few days, and calmly fell asleep, February 10th, 1900. His funeral was largely attended, many being anxious to show their respect for one so worthy. The Revs. W.R. Wilkinson, G. Newton and E.W. Gibson, took part in the service. We left his grave under the sense of a great loss, and yet with feelings of sincere gratitude that we had been permitted to know such a man. William was born at Saham Toney, Norfolk, to parents Robert Gathercole, a labourer, and Ann Wilson. William worked as an agricultural labourer for most of his life, although the 1881 census describes him as a farm steward. He married Mary Ann Leveret (abt 1819-1850) on 17 November 1839 at North Pickenham, Norfolk. Census returns identify two children. William married Sarah Lusher (1810-1882) in the spring of 1862 in the Swaffham Registration District, Norfolk.